You see, since back around turkey day, I've been having a minor issue with my oh so nice cell phone - it hasn't been ringing to tell me of an incoming phone call. Incoming text message- check. Voice mail from a missed phone call - check. That someone is calling me RIGHT NOW!!!! - not so much check. Boo went first, and though the very nice lady wasn't able to duplicate her typing stuck e issue, she got a ticket. Then it was my turn. "The phone doesn't ring on incoming calls". Really. Please check it ... the nice lady's eyes showed that it indeed wasn't ringing ... and then she said these fine words ... "You know you have the ringer off?" apparently this setting doesn't make the phone quieter when you listen to people. 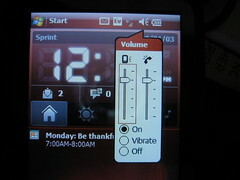 This setting keeps the phone from making noise on incoming calls. the phone rings on incoming calls. Imagine... the usefulness of that.